I adore the Webb’s Stain Glass Mystery series by Cheryl Hollon. Have you read it? If not, the link to buy it will be at the bottom of the page. For my first craft, I wanted to start out with the newest craze of painting rocks! Are you into painting rocks? Today I show you how to turn a rock into faux stained glass. I hope you like the video, share the video and post photos of YOUR finished faux stained glass rock project. Oh…and count how many times I say “um” in the video. Seriously, it’s a lot. Do you love walking through bookstores? Do you have a favorite? I sure do! I had a chance to go with my best friend to Barnes & Noble and we spent… I don’t know how much time exploring the stacks with our kids. Of course, I had to spend an inordinate amount of time in the cozy mystery section. I find myself saying hello to the books when I see the names because the names seem like friends to me. The looks I get, ha! Take some time this week to look on the inside covers too, to find out who creates these pieces of art that catch our eyes as we stroll by the shelves at our local bookstores. It’s usually on the inside left cover, a couple of pages in. And, don’t forget to buy, read, review and repeat. Oh, and let me know you were here by commenting. I wanna say hi! Hello fellow readers and authors! I am in LOVE with the rock I just painted today that celebrates my love of reading and supporting the artists that pen my world of make-believe. Two books and a cup of coffee just about sum it up for me. 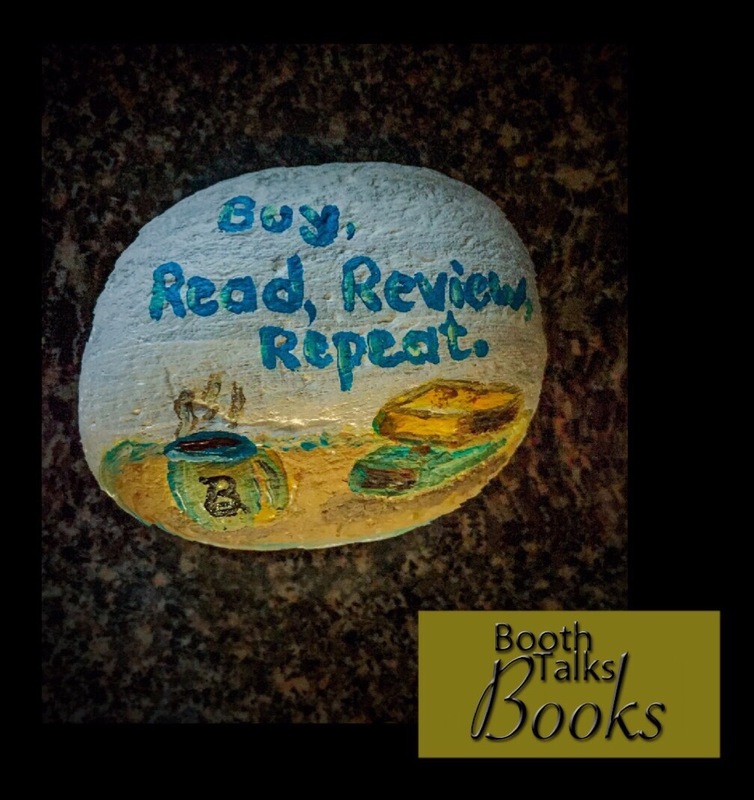 In a couple of weeks, I will be starting a bi-monthly series posted on Thursdays called, “The Book Effect; Crafting Between The Pages with Booth Talks Books. During each episode of The Book Effect, I will create a craft to accomany one of our favorite mystery books and show you how to produce it. Each craft will focus on a specific aspect of the book that is vital to the plot. These projects will be perfect for using at your book club or even while you read alone. It’s a fantastic way to tangibly connect with the story, characters and author in a new and different way! If you have a book and craft you would like me to feature one week, please contact me. I will be looking for new ideas all the time and would love to hear from you. My goodness…I hope you are as excited as I am. Tell your friends and join me, won’t you? I have never been to a lighthouse nor have I ever wanted to visit a lighthouse. I am not a fan of being out in the middle of the sea among the crashing waves, secluded from society. It has never sounded like something that would be of interest to me. Well, Ms. Blackwell, “A Ghostly Light” has now made me want to make a trip to the nearest lighthouse and go ghost hunting on my next day off. Well done! Mel Turner is a talented head of a renovation team, hired to renovate an 1871 lighthouse and home on Lighthouse Island near San Francisco. She also has the ability to see ghosts, which to me, is amazing. Spirits fascinate me. She struggles with this gift, however, but seems to be coming into her own thanks to the help of her boyfriend and family. After her best friend is accused of murdering an abusive ex-husband, Mel must help solve not only that murder with the help of the ghost of said ex husband, but also get involved in solving a century old mysterious disappearance of a young boy whose family used to live and watch the lighthouse. If you love ghosts, this one has three of them. They aren’t in the backstory either. They are right there in the mix with the living. There is also a ton of interesting history that, if you look into it via online and books, actually happened. For instance, female light keepers make the same as their male counter parts during the Victorian era. Wow, that’s a fun bit of information you don’t get everyday. Like I said, sign me up to visit the nearest lighthouse. The history alone on these must be fascinating and I love history. The character of Mel helps the reader really get into wanting to care about these old structures and the contents within. From the original woodwork to the old books and personal belongings of the former keepers, there is nothing in the adventure that the reader won’t enjoy. And yes, it is an adventure. In “A Ghostly Light”, I as a reader discovered a new interest wrapped within other interest I had, lighthouse exploration! Juliet Blackwell brought me into a fictional world that I can now take out into the real world and really experience…without the dead body hopefully. I haven’t read any books from the rest of her Haunted Home Renovation Mystery series but plan to after reading this piece. If you haven’t read the others either, don’t fret. This story stands alone. So, get on your life jacket, hard hat and your EMF detector and catch a boat to Lighthouse Island to meet with Mel and her crew. An adventure awaits. While in graduate school she published several articles based on her research with immigrant families from Mexico and Viet Nam, as well as one full-length translation: Miguel León-Portilla’s seminal work, Endangered Cultures. Juliet taught Medical Anthropology at SUNY-Albany, was producer for a BBC documentary about Vietnamese children left behind by US soldiers, and worked as an elementary school social worker in rural New York. Upon her return to California she became a professional artist and ran her own decorative painting, historical renovation, and domestic design studio for more than a decade. In addition to mainstream novels, Juliet pens the New York Times Bestselling Witchcraft Mysteries and the Haunted Home Renovation series. As Hailey Lind she wrote the Agatha Award-nominated Art Lover’s Mystery series. She is past president of Northern California Sisters in Crime and former board member of Mystery Writers of America. Juliet lives in a hundred-year-old house with extensive botanical gardens in Northern California, but spends as much time as possible in Europe and Latin America. She believes in the magic of language, travel, and cultural exchange to open hearts, minds, and souls. I love Tobi Tobias. She’s just the kind a gal I could see myself hanging out with and working with. Her knack with PR and getting the name of the customer out there really seems to be her strong suit. Today, we have an interview with the lady whose head she popped out of, Laura Bradford. I always enjoy when Laura stops by. BTB: What is it about the Tobi Tobias Mysteries that speaks to you as a writer? LB: With all the series I’ve written to date, the Tobi Tobias Mysteries are the only ones I’ve written in first person. It really allows the reader (and me) a chance to get inside Tobi’s head–to really see things the way she does as if you’re actually her. I think it makes her super relatable. It also helps that she’s a little kooky, a little self-deprecating, and a lot funny. BTB: One of Tobi’s most endearing sidekicks is her Grandpa Stu. He is my absolute favorite and seems like someone who is really out there somewhere in the real world. Do you have a Grandpa Stu? LB: While I loved both my grandfathers, neither were anything like Tobi’s grandfather. I love that they have the close relationship that they do and that you see, pretty quick, where some of Tobi’s own kookiness comes from. BTB: You’ve gotten a lot of really great reviews on DEATH IN ADVERTISING (Book # 1). What do you think is drawing people to this series? LB: I think it’s several things. Tobi is relatable, first and foremost. She’s just trying to make a go of her dream but keeps coming up against hiccups. We can’t help but cheer her on from the sidelines, you know? Second, I’d have to say it’s her crew of friends. They’re all very different from each other, but they’re loyal and true–something we either have in our lives or wish we did. And lastly, its a fun series with lots of laugh out loud moments. Who doesn’t need a few hearty laughs in their day (bonus points when it comes in conjunction with reading)? BTB: What propels Tobi to get involved in yet another murder in this latest installment in the series, 30 SECOND DEATH (book # 2)? Didn’t get enough in the last? Oh Tobi…..
LB: That’s easy. Carter McDade, her best friend, is considered a suspect in the murder of his co-worker–a true shrew in every sense of the word. Tobi knows Carter couldn’t hurt a flea, and she’s determined to prove it to everyone else. BTB: What’s next for Tobi and her crew? LB: The third book in the series, AND DEATH GOES TO…, will release December 5th. BTB: What’s on the horizon for you, as a writer? LB: Well, in addition to the third Tobi book in December, the third book in my Emergency Dessert Squad Mysteries will release in January. Beyond that, I’ll be released the sixth book in my Amish Mysteries in the spring and…come summer 2018…my first ever Amish based Women’s Fiction novel, PORTRAIT OF A SISTER, will be releasing with Kensington publishing. I’m so very excited about this book!! Thanks Laura for stopping by and thanks for coming up with some fun and dynamic characters for us to become hooked on! Now that you readers are here, leave a comment below for Laura or myself. And don’t forget to enter to win an ecopy of this amazing book at the bottom of this post! Laura Bradford is the national bestselling author of several mystery series, including the Emergency Dessert Squad Mysteries, the Amish Mysteries, the Jenkins & Burns Mysteries, and the brand new Tobi Tobias Mysteries. She is a former Agatha Award nominee, and the recipient of an RT Reviewer’s Choice Award in romance. When she’s not writing, Laura enjoys making memories with her family, baking, and being an advocate for those living with Multiple Sclerosis.